It's not easy to adapt after you find out that you have multiple sclerosis, but some changes to the menu and lifestyle will make you feel better, especially in the early stages of the disease. 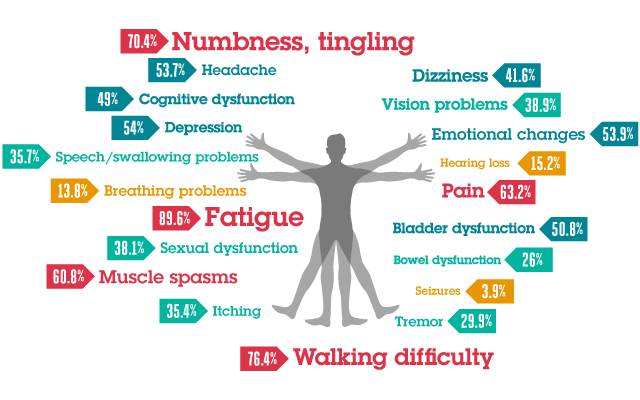 It is very difficult to find out that you have multiple sclerosis, many times the patients are overwhelmed by this news, especially if they think they will not be able to carry out their daily activities as before. Many times they wonder whether they will have to give up all the things they like in order to slow down the disease, and other people are thinking about helping a family member who suffers from this condition. It is best to start with small changes instead of completely eliminating certain activities. This will reduce the stress and anxiety that may occur during the adaptation process. The daily menu is one of the main ways you can take care of yourself. Many people who suffer from multiple sclerosis decide to avoid gluten and dairy products by focusing on eating fruits and vegetables. A lot of patients claim that dairy and gluten grains are worsening the bad symptoms and fatigue. - processed foods (fast food). There is no need to eliminate all of these foods right from the start, but you can start gradually reducing the amount of gluten and dairy consumed while observing the evolution of symptoms. For example, do you feel tired or much better when you do not eat gluten? You know your own body best. The level of hydration also counts, so make sure you drink at least 2l of water every day. At first it may seem very much, but if you always have a bottle of water with you, you'll get used to drinking more often. Depending on your personality, you may be delighted or it will be difficult for you to make more movement. It does not mean you have to start running 5km every day or become a gym expert, but it's enough to do simple things. In the days when you feel that you have enough energy take a walk outdoors, take care of the garden or practice yoga. If you do not want to be alone while doing these exercises, you can invite friends or family members to join you. It is very important to move at least 15 minutes each time you have the opportunity. In days when problematic symptoms do not allow you to do physical activity, it is enough to do stretching exercises right in the bed, or you can try exercises to tonify the upper body while sitting. Take your breaks and do not force yourself because your condition may get worse. If you do not feel too good doing exercises only 5-10 minutes. When you have multiple sclerosis certain days may be unpredictable. Sometimes you will feel very good, sometimes you will not even want to get out of bed. This is why specialists recommend you to make a weekly and monthly schedule. If you have this option, it's good to set up counseling or check-ups on the very same day of the week, so you get used to the pace at which you have to go to the doctor without feeling exhausted or not knowing for sure where or at what time you have to go. You can also prepare a list of questions about the treatment followed or the symptoms you feel. Multiple sclerosis can make you feel exhausted and the best solution to counteract this is relaxation. Book a part of every day to rest. For example, you can sleep in the afternoon or you can choose another interval to relax. Choose the right time and the people you meet with. Be careful about how you feel before the event, tell your friends, but do not feel stupid if you have to give up. Another option is to organize a meeting right at your home and ask the guests to bring drinks and food. This will save your energy and you will not have to make very complex preparations.